Maintenance guys are the best around!!!! Absolutely thrilled to have lived here. Cats and dogs up to 75 lbs are permitted. Limit 2 indoor pets per apartment. Breed restrictions apply. Exotic pets are not permitted. $500 pet fee for 1st pet and $250 for 2nd pet; $15 monthly pet rent per pet. $150 application fee per applicant; $325 administration fee; $300 deposit 1 bedroom, $400 deposit 2 bedroom; $500 deposit 3 bedroom with approved credit. $25 per month valet trash; $15 per pet pet rent; water/sewer depending on consumption. 3x monthly rent. See property guidelines for credit qualifications. The decision will be based in whole, not in part. Reference lease termination addendum in lease, option 1 (2 month rent penalty as liquidated damages) option 2 (rent responsible until apartment is re-rented as liquidated damages). Yes, you will be charged according to your lease for a month-to-month lease. Yes, if the corporation meets our qualification guidelines. 1st and is considered late after close of business on the 3rd. Guests are welcome and you must register their vehicle for the duration of their stay. Any guest staying longer than 7 consecutive days without our prior written consent, and more than twice that many days in any one month, must be added to the lease, per paragraph 2 in your lease agreement. We do not have assigned parking, but provide parking decals to all residents. Only 1 vehicle per licensed resident is allowed. Maximum number of vehicles per apartment: 1 bedroom- 2 vehicles; 2 bedroom- 2 vehicles; 3 bedroom- 3 vehicles. In your garage or driveway if your apartment has a garage, and in the open lot if your apartment does not have a garage. Yes, they must be added to your lease as occupants if staying more than 14 consecutive days per month. On site management will need to approve the location prior to installation and you will pay an additional $200 refundable deposit and carry renters insurance. Yes, heated pool and jacuzzi. Yes, included in Valet Waste pick up schedule. All grills must be used only on the ground level and will be placed a minimum of 15 feet from any building. Grills may not be stored on the patio or balcony. Yes, however, charges may apply at the time of move out. We do not accept packages. Please contact the Leasing Office for information about our Corporate Advantage Program. Take Interstate 95 North toward West Palm Beach to State Road-834/Sample Rd Exit (Exit 39).Turn left onto E. Sample Rd/State Road-834. Turn right onto Lyons Road. Turn left onto Wiles Road, Solaire at Coconut Creek is approximately 1 mile on the right. Take Exit 41 SW 10th St./FL-869 toward Sawgrass Expressway, turning right onto SW 10th Street. Continue straight onto the Sawgrass Expressway. Take Exit 18B to merge onto FL-7/State Rd 7/441 South. Turn left onto Wiles Rd, Solaire at Coconut Creek is approximately .5 miles on the left. Take Interstate 95 South toward Miami to State Road-834/Sample Rd Exit (Exit 39). Turn right onto E. Sample Rd./State Road-834. Turn right onto Lyons Road. 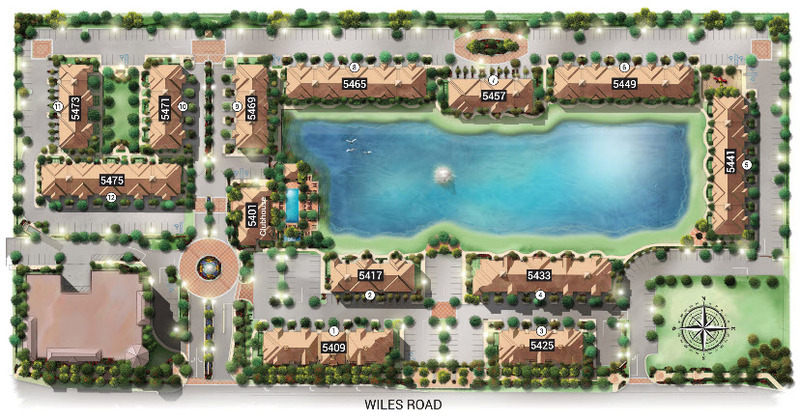 Turn left onto Wiles Road, Solaire at Coconut Creek is approximately 1 mile on the right. Take Exit 41 SW 10th St./FL-869 toward Sawgrass Expressway, turning left onto SW 10th Street. Continue straight onto the Sawgrass Expressway. Take Exit 18B to merge onto FL-7/State Rd 7/441 South. Turn left onto Wiles Rd, Solaire at Coconut Creek is approximately .5 miles on the left. Solaire at Coconut Creek features a premier address for both business and leisure. Residents can choose from a variety of one, two, or three bedroom apartments, each with first-class amenities and features. Our pet-friendly apartments in Coconut Creek include stainless Energy Star appliances, USB charging stations, and oversized walk-in closets. You'll love coming home to our beautifully landscaped community complete with scenic lake-side jogging paths, a lovely outdoor playground, and state-of-the-art fitness center with free weights and yoga! With quick access to Highway 7 and Florida’s Turnpike, you can commute anywhere in Southeast Florida with unmatched ease from our Coconut Creek apartments. Students of our community will attend Monarch High School. If you are looking for somewhere to shop until you drop, The Promenade at Coconut Creek has every store you could want and so much more. Remember – Solaire is a pet-friendly apartment community, with pet amenities including a dog park with bathing station! Contact us today to schedule a tour of the best apartments in Coconut Creek and discover the lifestyle that Solaire can offer you!